Bản tóm tắt: The SYZ conjecture gives a geometric description of the relation between mirror pairs of Calabi-Yau varieties. It was a fundamental insight of Kontsevich and Soibelman that the structures predicted by the SYZ conjecture can be found in the world of non-archimedean geometry (Berkovich spaces). I will explain some of the main ideas, as well as the connections with the minimal model program in birational geometry. 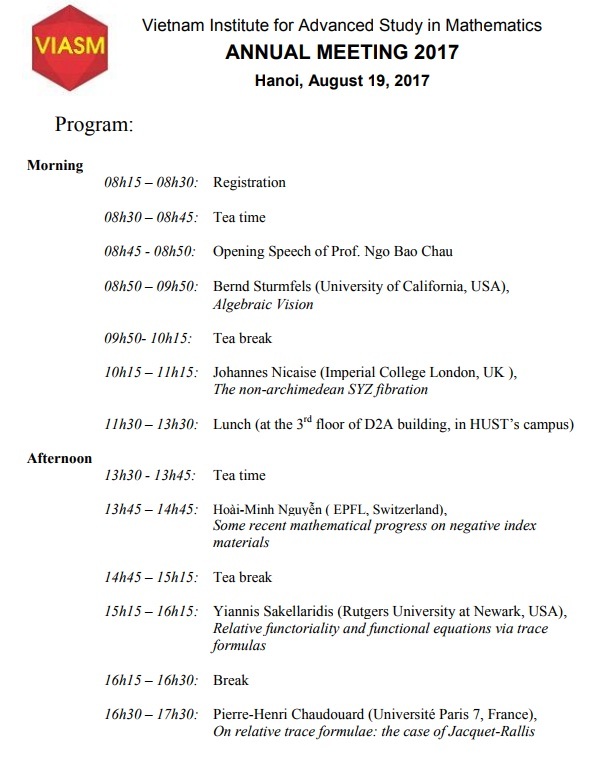 This talk is based on joint work with Mircea Mustata and Chenyang Xu. Bản tóm tắt: Negative index materials (NIMs) are artificial structures whose refractive index has negative value over some frequency range. These materials were investigated by Veselago in 1964 and their existence was confirmed experimentally by Shelby, Smith and Schultz in 2001. NIMs have attracted a lot of attention in the scientific community not only because of their many potential interesting applications but also because of challenges in understanding their appealing properties. Mathematically, the study of NIMs faces two difficulties. First, the equations modelling NIMs have sign changing coefficients; hence the ellipticity and the compactness are lost in general. Secondly, the localized resonance, i.e., the fields blow up in some regions and remain bounded in some others as the loss goes to 0, might appear. In this talk, I discuss some recent mathematical progress in understanding properties of NIMs such as the stability and their applications such as cloaking and superlensing using NIMs. Tiêu đề: Relative functoriality and functional equations via trace formulas. light on the general case. Bản tóm tắt: Algebraic vision is an emerging field at the interface of algebraic geometry and computer vision. One specific direction, to which geometers have contributed, is the design of algorithms that reconstruct a 3D scene from multiple 2D images. This lecture offers an introduction to this subject, with an emphasis on recent projects and open problems. Tiêu đề: "On relative trace formulae: the case of Jacquet-Rallis"
hand there is a strategy due to Jacquet-Rallis to attack these conjectures. We will explain the approach which is based on the use of a relative trace formula and we will report on recent progress on this topic.